Top view of Velella velella. Note blue disk and clear, angled chitinous float. 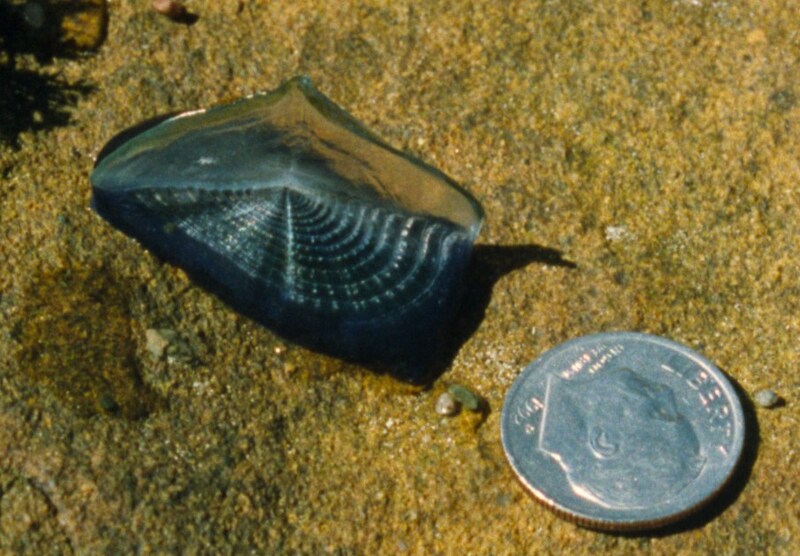 Underside of Velella velella, showing short tentacles. Description: A small blue float made of concentric circles of gas-filled tubes. Up to 8 cm in diameter (usually 4 to 6), with a clear chitinous semicircular sail above and small tentacles below. The sail is angled left or right from the long axis of the float. Floats far offshore, but may be blown onshore in large numbers by some winds, especially in spring and early summer. Found worldwide in the temperate and tropical oceanic zone. How to Distinguish from Similar Species: There are no similar species. The attached colonial hydrozoan Tubularia has a similarly structured (though much smaller) polyp but would not be mistaken for this species. 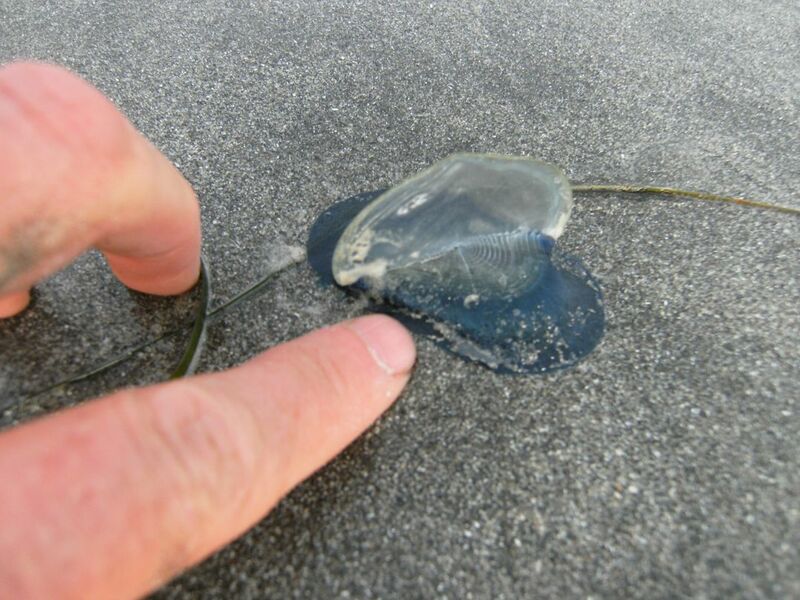 The 'bluebottle' found for example in Australia is a similar color of blue but has an inflated float like a Portuguese man-of-war. Geographical Range: The species is pelagic and usually offshore, though thousands may be blown ashore by strong onshore winds (especially during El Nino), mostly during late spring and early summer. It occurs worldwide in temperate and tropical seas. Depth Range: Float on surface (pleuston). Biology/Natural History: This species is a puzzling one. It has long been regarded by many as a type of siphonophore; a pelagic colony of hydrozoan polyps similar to Physalia, the Portuguese man-of-war. Recent study suggests that, instead, it is a single very large hydrozoan polyp (Order Chondrophora), floating mouth downward and with a chitinous float and sail instead of a column. If so, it is an extremely large polyp for a hydrozoan. At any rate, the underside also includes many small polyps that bud off small medusae. The medusae (up to 1.5 mm tall) sink to as far as 2000m depth and produce gametes. The developing embryos develop floats and rise back to the surface. This species is oceanic, being usually found far offshore. The angled sail makes it sail at 45 degrees from the prevailing wind. Some have a sail angled to the left, others to the right. Off California the right-angled form prevails, and these remain offshore in the prevailing northerly winds. Strong southerly or westerly winds, however, may bring huge aggregations ashore. 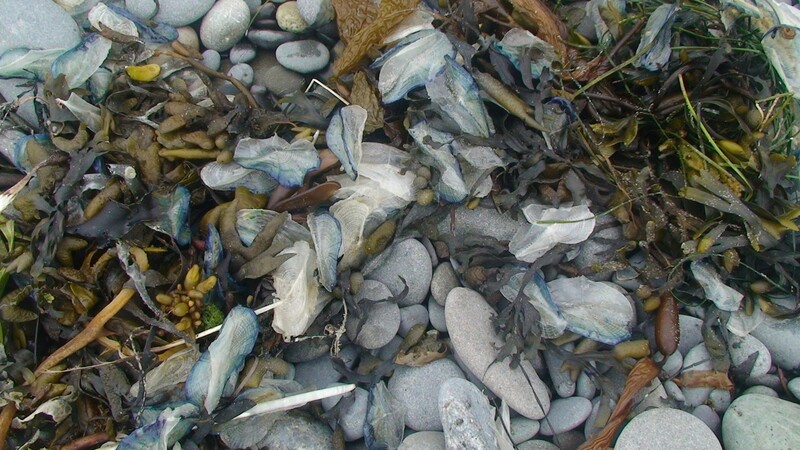 Velella have symbiotic algae (zooxanthellae) in their tissues, and also feed on zooplankton. They are eaten by pelagic gastropods such as some nudibranchs and bubble-rafting snails. The pelagic gooseneck barnacle Lepas anatifera occasionally attaches to the dead chitinous floats. This species has many nematocysts and a few people have reported feeling a sting, but I have handled many and have never been stung even slightly. The species feeds on fish eggs and crustacean larvae. In the summer of 2014 a huge number of by-the-wind sailors were washed up all up and down the Oregon and Washington open coast. Here is a collection of several at the high tide wrack line at Rialto Beach.